The Breach Notification is used to give notice of breach of agreement and demanding corrective action or compliance. It is much more cost effective to resolve disputes without the involvement of an attorney. Simply consulting an attorney about what to do can cost hundreds of dollars. A letter from your attorney on their letterhead may also be an effective means of resolving a problem. using the Contract pack for the past 3 years and it has been a life saver for me. When I need to submit contracts on the go I turn to my contract pack. I love it and recommend to any serious minded people." This Breach of Contract Notification Form is included in editable Word format that can be customized in Word or by using the included Wizard software. Phone Phone Number - Fax Fax Number. The purpose of this letter is to give formal notice of your breach of our Agreement Insert the title of the contract or agreement which was breached, dated Start Date. Specifically, you are in breach of paragraph Insert Paragraph Breached here of the Agreement, which provides what was breached. Please be advised that if Insert corrective action that must be done, I will have no choice but to refer this matter to legal counsel for appropriate action. 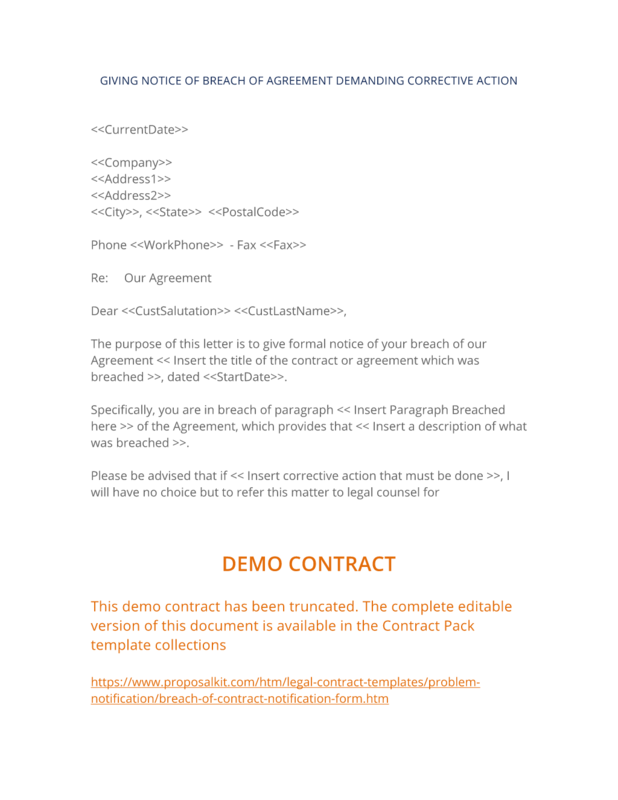 The complete Breach of Contract Notification Form - with the actual formatting and layout - is available in this Contract Pack.